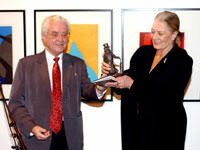 Vanessa Redgrave was presented with the Ibsen Centennial Award for her outstanding interpretations of many of Ibsen’s leading characters during the official UK Ibsen Year opening, which took place on the press night of Dale Teater Kompani’s Little Eyolf, at the Riverside Studios, London, on Tuesday 24 January 2006. 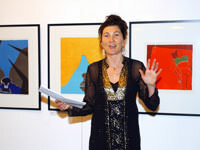 Eve Best officially opened Ibsen Year and spoke of Ibsen’s broad appeal in her speech. She highlighted that at least one of his plays is performed on a stage somewhere in the world every single day. Dale Teater Kompani is very pleased that the Norwegian Embassy had chosen to arrange the occasion around its production and is extremely grateful for their support. 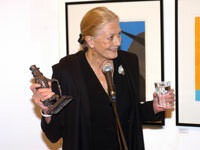 Vanessa Redgrave, who was given the prize by Lars Roar Langslet, former Minister of Cultural Affairs and chairman of the National Ibsen Committee, spoke of how the topics in Henrik Ibsen’s plays are still relevant today - and then in particular the issues that Ibsen’s female characters encounter. Redgrave is the eleventh actress to receive the award - it has already been presented to some of the world’s most prominent female Ibsen interpreters at the Ibsen Year opening in Oslo on Saturday 14 January. British actresses Glenda Jackson and Claire Bloom as well as Isabelle Huppert of France, Angela Winkler of Germany, Saoli Mitra of India and Scandinavian first ladies of theatre Ghita Nørby (Denmark), Bibi Andersson (Sweden), Liv Ullmann, Lise Fjeldstad and Wenche Foss (all three from Norway) received the award. 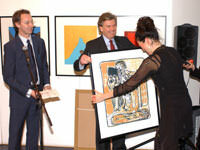 At the UK ceremony, Best and Redgrave were also given artworks from the Ibsen Art 2006 exhibition which was timed to run concurrently with Dale Teater’s Little Eyolf at the Riverside Studios. 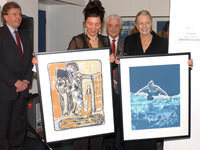 Best received a piece by artist Thomas Knarvik which was based on the play Hedda Gabler, whereas Redgrave’s artwork was by Ulf Nilsen who had interpreted The Lady from the Sea and its main character, Ellida, whom Redgrave has played. Ibsen Art 2006 displayed artwork based on the most important plays as seen through the eyes of the six contemporary Norwegian artists Therese Nortvedt, Hanne Christiansen, Thore Hansen, Bjørn Carlsen, Ulf Nilsen and Thomas Knarvik. 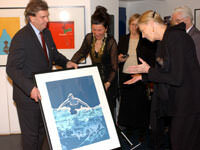 Following the presentation of the award and artworks to Best and Redgrave, the guests attended the opening performance of Little Eyolf.